Heat oven to 350ºF. Line jelly roll pan, 15 1/2x10 1/2x1 inch, with foil. In large bowl, beat eggs, milk and seasoned salt thoroughly with fork or wire whisk until a uniform yellow. Spray large skillet with nonstick cooking spray. Pour egg mixture into skillet. As mixture begins to set at bottom and side, gently lift cooked portions with spatula so that thin, uncooked portion can flow to bottom. Avoid constant stirring. Cook 8 to 10 minutes or until eggs are thickened throughout but still moist. Stir in chopped dill weed. Spoon about 1/3 cup eggs down centre of each tortilla. Top with salmon, onion and cheese. Fold opposite sides of each tortilla over filling (sides will not meet in centre). Roll up tortilla, beginning at one of the open ends. Place wraps, seam sides down, in pan. Cover with foil. Bake about 10 minutes or until cheese is melted. Garnish with dill weed sprigs. Tip: Refrigerate wraps up to 2 hours before serving; bake 13 to 15 minutes. 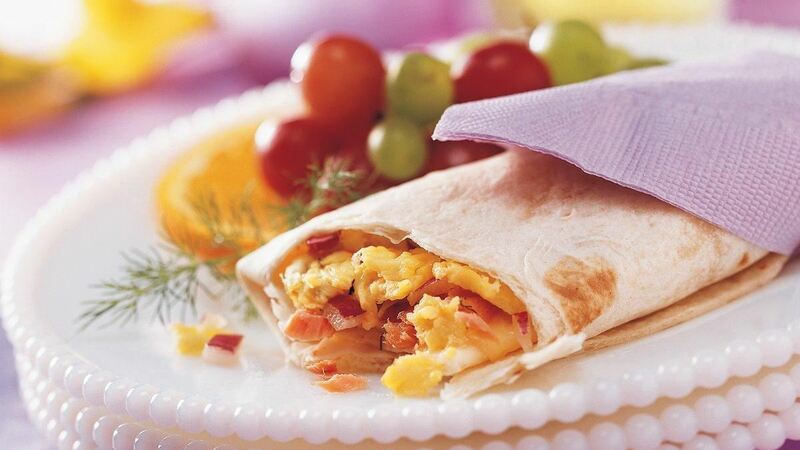 Tip: Wrap a pretty napkin or piece of brightly coloured food-safe paper around each egg wrap. Choose colours to coordinate with your centrepiece for a special, festive look.